Ask: Who is the strongest person you know? What is that person able to do that other people can’t? Where do you think that person got their strength? Say: In our story today we’ll hear about how strong and powerful God is. We’ll learn that it’s God’s power that brings victory! Say: As you hear to the assembly lesson, listen for ways that God’s power brought victory to His people. Pray that God would open our hearts to His Word today. Say: I want everyone to close your eyes and imagine that you are standing on the bank of a strong, rushing river. Imagine that you have to get to the other side but you don’t have a boat. What would you do? Say: In our story today we’ll hear how God helped the people of Israel cross over a strong, raging river and how He helped them defeat their enemies as they entered the Promised Land. Our main point today is “God’s power brings victory.” Let’s say it together with the hand motions. Say: Last week we heard the story of the two spies that entered Jericho and met Rahab. 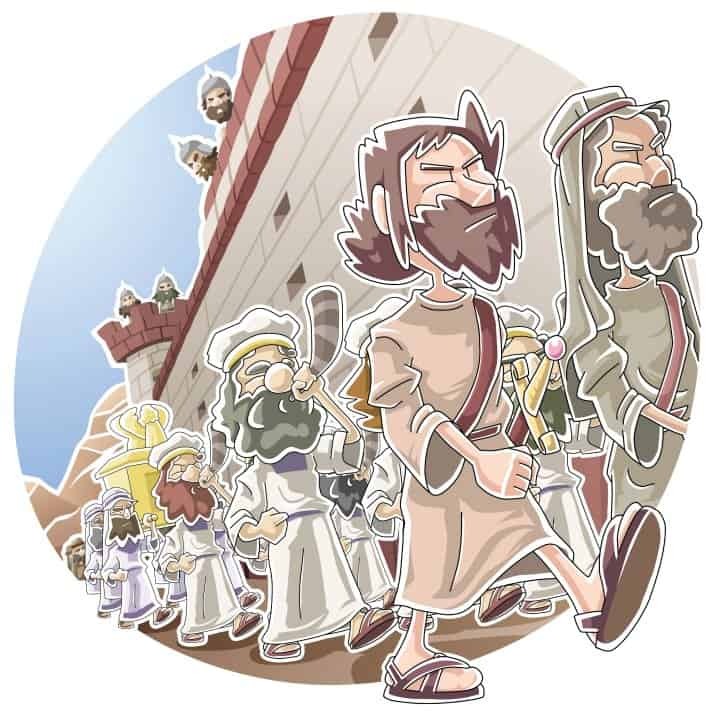 The spies returned to Joshua to report that the people of Jericho were terrified of the Israelites because they had heard about all the things God had done for them. Tell the Story: The time had come for the Israelites to enter the Promised Land! The only thing keeping the people from the land God had promised them was the Jordan River. God told them to carry the Ark of the Covenant in front of them. As soon as their feet touched the water something amazing happened. The water piled up on one side farther up the river so the people were able to cross over on dry ground! Main Point: God’s power brings victory! Tell the Story: As the people crossed the dry riverbed God told them to select 12 stones (to represent the 12 tribes of Israel) and bring them out of the river. The people then set up the stones so they would remember something very important about God. Ask: What do you think God wanted the people to remember? Tell the Story: The Israelites were all finally on the other side of the Jordan and they came to the city of Jericho—the same city that the two men had come to spy on. There was a great wall around the city—a tall, strong wall. But one thing the people learned from crossing the river was that God is powerful, and His power brings victory! As the people looked up at that city wall they might not have known how God was going to bring them victory, but they knew that He would do it because He had promised that He would! Tell the Story: God gave Joshua some very interesting instructions. Let’s read from God’s Word and find out what they were supposed to do. Ask: What did God tell the people to do? Tell the Story: When the walls of the city collapsed the fighting men of Israel rushed in and destroyed the city. Only one family was spared. As the Israelites entered the city they saw a red cord hanging from a window. Who’s window was it? That’s right; Rahab had hung the red cord from her window as a sign that she and her family would be saved. The spies had kept their promise to her since she helped hide them from the king. Tell the Story: God told Joshua that they were to destroy everything in the city except for the gold, silver, bronze, and iron. Those things would be put into the Lord’s treasury. God warned the people not to take anything else out of the city. Say: God’s power was what brought them victory over their enemies. Ask: Can you imagine being an Israelite marching around Jericho for 6 days in silence? What must they have been thinking? Do you think they ever started to wonder what God was doing? Say: God wanted to show the people that only He was powerful enough to bring them victory, and He would get all the glory! Ask: Could the people take any credit for breaking down the city wall? (Nope!) All they did was walk around in a circle and shout. It was God’s power that brought down the wall! Ask: Did you know that in some ways we’re just like the Israelites? Say: We also have an enemy that we are powerless to defeat. Does anyone know what our worst enemy is? (Sin) Just like the Israelites faced the strong wall of Jericho, sin is like a strong wall in our hearts. We aren’t strong enough to bring that wall down. Only Jesus’ death on the cross can do that, and God gets all the glory! Say: We all struggle with temptation to sin, even after Jesus has saved us. But when you feel tempted to sin you can remember that God’s power gives you victory! You can pray and ask God to help you overcome that temptation just like He helped the Israelites defeat Jericho. Pray Dear God, thank you for teaching us today that your power brings victory. Thank you for defeating the sin in our hearts and bringing us closer to you. Amen. Have the kids sit down and explain that you are going to read from a list of statements. If the statement is something people can do, stand up. If it’s something only God can do, reach down and touch the floor. Explain that many stories in the Bible highlight our great need for God. He is the one who sustains our life and also provides a way for us to live with him eternally. God is so powerful and is able to do so many things that we can’t. He gets all the glory for what He does and who He is! Divide the class into two teams. Each team will line up on one side of the room with their team’s 12 stones. One at a time the kids will grab a stone, run to the other end of the room, place the stone on the floor, and run back. The first team to build a stone tower wins. Explain that the Israelites brought the 12 stones out of the Jordan River to set up as a reminder of all that God had done for them. Ask the kids to think about the ways they’ve seen God’s power displayed in their own lives. Tony Kummer (Editor) reviewed & updated this page on : January 12, 2016 at 10:37 pm. All our content is peer reviewed by our readers, simply leave a comment on any post suggest an update.